This is so cute and was a hit at Card Club. Perfect card for all the fish loving kids and friends. I swiped Bermuda Blue Ink across white card stock to make it look like water, then glued that to Tangerine Tango card stock. Stamp the sea fan from a past stamp set. 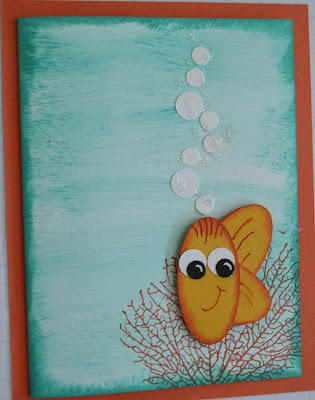 I used the small oval punches to create the fish adding white and black circle punches for the eyes and bubbles. Yes add some dazzling diamond glitter to the bubbles for the sparkle. Soooo stink'in cute!